First wash the rice and cook it upto 2 whistles and let it cool.Do not over cook or mash the rice. Take a wide pan, preheat the sesame oil and add mustard seeds, when it splutters, add urid dal, channa dal, fenugreek seeds, green chillies, ginger, groundnuts, cashew nuts, asafoetida powder and curry leaves and fry these ingredients in a medium flame, to golden brown. Do not burn these ingredients. Turn off the stove and pour these ingredients on top of the rice. Add salt and stir it well till these ingredients get mixed with the rice. Now pour the lemon juice on top of the rice and stir it carefully. You can use 1/2 or 1 lemon (according to its size) juice. Garnish it with fresh coriander leaves. 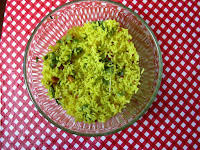 Now lemon rice is ready to serve. Note: Its always better to mix the rice later and not on the stove top. Also do not add the lemon juice with hot ingredients like mustard seeds, sesame oil etc. It will spoil the taste of the lemon rice.